It’s time to lace up those sneakers because the 22nd annual Susan G. Komen Massachusetts Race for the Cure in South Boston is coming up this Sunday, September 28th. 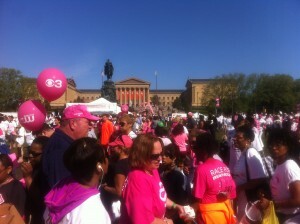 Race for the Cure is the world’s largest fundraising event that combats breast cancer. 2,000 participants came last year and even more are expected this go-around. Maia Yogurt will be attending the event to support runners, walkers, families, friends, and survivors with lightly sweetened Greek yogurt. The Maia Team passed out over 20,000 cups of yogurt at past Race for the Cure events so expect more creamy deliciousness at the South Boston race! Maia Yogurt gives 10% of our profits back to charity so of course we jumped at the chance to sponsor such an amazing cause. Susan G. Komen is a world leading non-profit in breast cancer advocacy, education, and awareness. Maia previously sponsored Susan G. Komen races in Hunt Valley, Ocean City, West Orange, Portsmouth, Pittsburg, Philadelphia, and Cleveland. New Maia-lover Bob G. found us at the Susan G Komen Race for the Cure in downtown Cleveland and said, “I love your yogurt and also the fact it has real low sugar, active cultures and all natural ingredients.” Thanks, Bob! We can’t wait to give racers in Boston some yogurt, spoons and smiles! The race will be held at DCR Carson Beach Mother’s Rest Area in South Boston, MA at 9pm. Arrive early so that you can register and be on the lookout for the Maia Team handing out goodies! We can’t wait to pass out yogurt to the good folks of Boston!